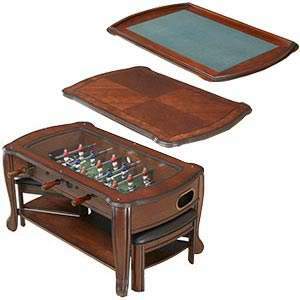 This beautifully crafted mini foosball 3-in-1 table will bring your family hours of fun. The mini foosball table is fully functional and allows you to test your skills against another player in a 9-player vs. 9-player game format. The furniture quality table is constructed of solid wood and wood veneer and comes with two padded ottomans which store neatly under the table when not in use. The play field is covered with tempered glass for safety and added functionality. 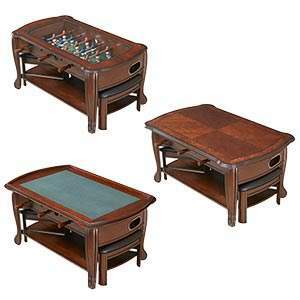 The table also comes with a matching removable conversion top. This dual function conversion top has a padded, felt-covered surface on one side which is perfect for playing cards, games, puzzles, and other activities. The reverse side of the conversion top is an elegant design of wood veneer patterns which will complement any home and allow the table to serve as cocktail table when the game is not in use. my mum has this, it's quite big but it's fab! Fair enough! Just from the pics it looks like one of these 'executive toys'! Fair enough! Just from the pics it looks like one of these 'executive … Fair enough! Just from the pics it looks like one of these 'executive toys'!